Fleetwood boosted their survival hopes by beating Scunthorpe for just their second League One win of the year. Fit-again midfielder Jimmy Ryan had instant impact, setting up Ash Hunter to lob in the opener early on. Within minutes it was 2-0, with Bobby Grant nodding home Antoni Sarcevic's cross from the left. 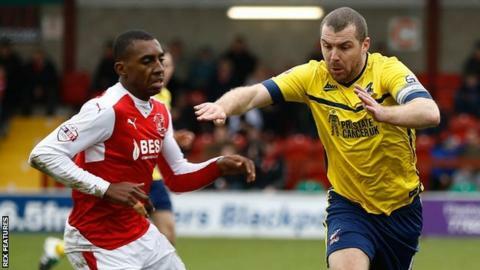 In the second half, Scunthorpe's Paddy Madden scored from the spot when Tom Hooper was pushed over, but Fleetwood ended strongly for a deserved win. "I think the performance was probably a bit chalk and cheese in terms of the two halves of the game. "Everybody knows that getting the first goal is key, we didn't get that. "We expected a really tough challenge after a really long week and successful week for us, but they got the first goal. "Two things in the first half put us on the back foot, but we adjusted the shape slightly to stay in the game - I thought we did that really well and that was the foundation for our second-half performance which was excellent." Match ends, Fleetwood Town 2, Scunthorpe United 1. Second Half ends, Fleetwood Town 2, Scunthorpe United 1. Jim O'Brien (Scunthorpe United) wins a free kick in the defensive half. Conor Townsend (Scunthorpe United) wins a free kick in the defensive half. Attempt missed. Shola Ameobi (Fleetwood Town) left footed shot from the centre of the box is close, but misses to the left. Corner, Fleetwood Town. Conceded by Murray Wallace. Attempt blocked. Jimmy Ryan (Fleetwood Town) right footed shot from the centre of the box is blocked. Attempt saved. Jimmy Ryan (Fleetwood Town) right footed shot from the centre of the box is saved in the top centre of the goal. Corner, Scunthorpe United. Conceded by Tyler Hornby-Forbes. Jamie Ness (Scunthorpe United) wins a free kick on the right wing. Attempt saved. Greg Luer (Scunthorpe United) header from the centre of the box is saved in the top centre of the goal. Attempt saved. Wes Burns (Fleetwood Town) right footed shot from the left side of the box is saved in the top right corner. Attempt missed. Greg Luer (Scunthorpe United) right footed shot from the centre of the box is high and wide to the right. Attempt missed. Shola Ameobi (Fleetwood Town) right footed shot from a difficult angle on the right is close, but misses to the left. Foul by Shola Ameobi (Fleetwood Town). Chris Maxwell (Fleetwood Town) is shown the yellow card. Substitution, Fleetwood Town. Wes Burns replaces Ashley Hunter. Attempt missed. Greg Luer (Scunthorpe United) left footed shot from the centre of the box is high and wide to the left. Jimmy Ryan (Fleetwood Town) wins a free kick on the left wing. Substitution, Scunthorpe United. Greg Luer replaces Tom Hopper. Goal! Fleetwood Town 2, Scunthorpe United 1. Paddy Madden (Scunthorpe United) converts the penalty with a right footed shot to the bottom left corner. Penalty conceded by Stephen Jordan (Fleetwood Town) after a foul in the penalty area. Penalty Scunthorpe United. Tom Hopper draws a foul in the penalty area. Corner, Scunthorpe United. Conceded by Shola Ameobi. Corner, Scunthorpe United. Conceded by Antoni Sarcevic. Marcus Nilsson (Fleetwood Town) is shown the yellow card.